Providing you the best range of abalam, virataz r, vonavir, vonaday, tavin 300mg and tavin l with effective & timely delivery. Abalam is associated with HIV-1infection treatment. Lamivudine is a prohibitor of reverse transcriptase enzyme, analogue of Zalcitabine. 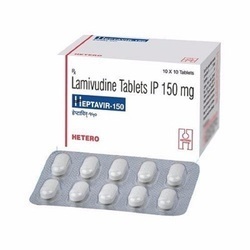 Lamivudine is artificially delegated nucleoside analogue, dynamic in both HIV-1 diseases and hepatitis B contamination conditions. Abacavir is a nucleoside analogue of HIV reverse transcriptase inhibitor, also an analogue of guanosine. Because of quality of this analogue, the HIV viral load ought to be lessened and defers or keeps the decimation of invulnerable framework. Both abacavir and lamivudine are none relieving the contamination; however it ready to lessen the movement of HIV disease to AIDS. Abalam tablets should be administered with or without food. Abalam should not be chew, crush or broke. It should be administer with whole of water. Virataz R Tablet is used for Hiv, Aids, Human immunodeficiency virus infections and other conditions. 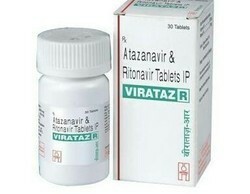 Virataz R Tablet contains Atazanavir and Ritonavir as active ingredients. Hetero Healthcare (Genx) manufactures Virataz R Tablet. Vonavir Tablet is used for HIV, Hepatitis B virus, HIV infection and other conditions. Vonavir Tablet may also be used for purposes not listed in this medication guide. 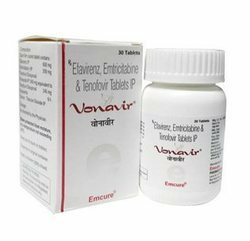 Vonavir Tablet contains Efavirenz, Emtricitabine and Tenofovir as active ingredients. Emcure Pharma manufactures Vonavir Tablet. Before using Vonavir Tablet, inform your doctor about your current list of medications, over the counter products (e.g. vitamins, herbal supplements, etc. ), allergies, pre-existing diseases, and current health conditions (e.g. pregnancy, upcoming surgery, etc.). Some health conditions may make you more susceptible to the side-effects of the drug. Take as directed by your doctor or follow the direction printed on the product insert. Dosage is based on your condition. Tell your doctor if your condition persists or worsens. Vonaday Tablet is used for Hiv, Hiv infection, Hepatitis b virus, Hepatitis b virus infection and other conditions. 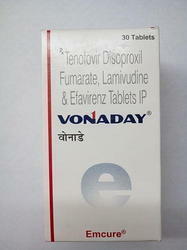 Vonaday Tablet contains Lamivudine and Tenofovir as active ingredients. Emcure Pharma manufactures Vonaday Tablet. Before using Vonaday Tablet, inform your doctor about your current list of medications, over the counter products (e.g. vitamins, herbal supplements, etc. ), allergies, pre-existing diseases, and current health conditions (e.g. pregnancy, upcoming surgery, etc.). Some health conditions may make you more susceptible to the side-effects of the drug. Take as directed by your doctor or follow the direction printed on the product insert. Dosage is based on your condition. Tell your doctor if your condition persists or worsens. Tavin 300 mg Tablet is an antiviral medicine which is used to treat human immunodeficiency virus (HIV) and hepatitis B virus (HBV) infections. This medicine is not a cure for HIV or HBV. It only prevents the virus from multiplying in your body. Close monitoring of liver function and kidney function is necessary while receiving this medicine. Take this medicine as per doctor advice. Tavin l Tablet is used for Hiv infection, Hepatitis b virus infection, Chronic hepatitis b and other conditions. 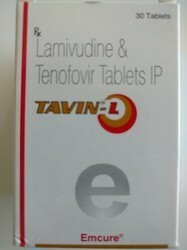 Tavin l Tablet contains Lamivudine and Tenofovir Disoproxil Fumarate as active ingredients. Before using Tavin l Tablet, inform your doctor about your current list of medications, over the counter products (e.g. vitamins, herbal supplements, etc. ), allergies, pre-existing diseases, and current health conditions (e.g. pregnancy, upcoming surgery, etc.). Some health conditions may make you more susceptible to the side-effects of the drug. Take as directed by your doctor or follow the direction printed on the product insert. Dosage is based on your condition. Tell your doctor if your condition persists or worsens. 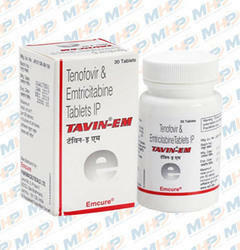 Tavin Em Tablet is used for Hiv, Hiv infection, Hepatitis b virus and other conditions. Tavin Em Tablet may also be used for purposes not listed in this medication guide. Tavin Em Tablet contains Emtricitabine and Tenofovir as active ingredients. Emcure Pharma manufactures Tavin Em Tablet. Before using Tavin Em Tablet, inform your doctor about your current list of medications, over the counter products (e.g. vitamins, herbal supplements, etc. ), allergies, pre-existing diseases, and current health conditions (e.g. pregnancy, upcoming surgery, etc.). Some health conditions may make you more susceptible to the side-effects of the drug. Take as directed by your doctor or follow the direction printed on the product insert. Dosage is based on your condition. Tell your doctor if your condition persists or worsens. 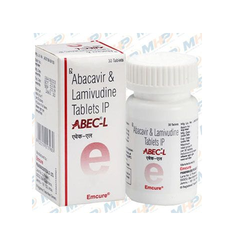 Abec L tablets are anti-retroviral medication, which containing an active substances like abacavir & lamivudine. Abec L is involved in HIV-1infection treatment. Lamivudine is chemically classified as nucleoside analogue, active in both HIV-1 infections & hepatitis B infection conditions. Abacavir is a nucleoside analogue of HIV reverse transcriptase inhibitor, analogue of guanosine. Due to presence of this analogue, the HIV viral load should be reduced and postpones or prevents the destruction of immune system. 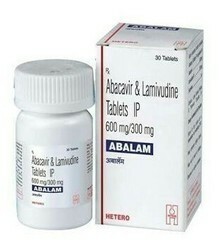 Both abacavir & lamivudine are none curing the infection, but it able to reduce the progression of HIV infection to AIDS. Before using Abec L Tablet, inform your doctor about your current list of medications, over the counter products (e.g. vitamins, herbal supplements, etc. ), allergies, pre-existing diseases, and current health conditions (e.g. pregnancy, upcoming surgery, etc.). Some health conditions may make you more susceptible to the side-effects of the drug. Take as directed by your doctor or follow the direction printed on the product insert. Dosage is based on your condition. Tell your doctor if your condition persists or worsens. 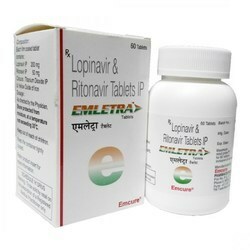 Emletra Tablet is a medicine that is used for the treatment of Hiv, Aids, Urinary tract infection and other conditions. Emcure Pharma manufactures Emletra Tablet. Before using Emletra Tablet, inform your doctor about your current list of medications, over the counter products (e.g. vitamins, herbal supplements, etc. ), allergies, pre-existing diseases, and current health conditions (e.g. pregnancy, upcoming surgery, etc.). Some health conditions may make you more susceptible to the side-effects of the drug. Take as directed by your doctor or follow the direction printed on the product insert. Dosage is based on your condition. Tell your doctor if your condition persists or worsens. Atazor Capsule is a medicine that is used for the treatment of Hiv infections, Human immunodeficiency virus infections and other conditions. 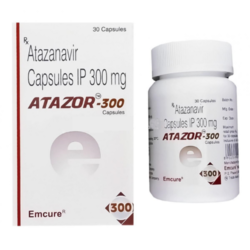 Emcure Pharma manufactures Atazor Capsule. Before using Atazor capsule, inform your doctor about your current list of medications, over the counter products (e.g. vitamins, herbal supplements, etc. ), allergies, pre-existing diseases, and current health conditions (e.g. pregnancy, upcoming surgery, etc.). Some health conditions may make you more susceptible to the side-effects of the drug. Take as directed by your doctor or follow the direction printed on the product insert. Dosage is based on your condition. Tell your doctor if your condition persists or worsens. Zidine Tablet is used for Hiv infections and other conditions. Zidine Tablet may also be used for purposes not listed in this medication guide. Zidine Tablet contains Zidovudine as an active ingredient. Zidine Tablet works by blocking the enzyme required for viral growth. 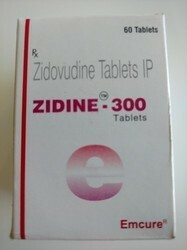 Emcure Pharma manufactures Zidine Tablet. Before using Zidine Tablet, inform your doctor about your current list of medications, over the counter products (e.g. vitamins, herbal supplements, etc. ), allergies, pre-existing diseases, and current health conditions (e.g. pregnancy, upcoming surgery, etc.). Some health conditions may make you more susceptible to the side-effects of the drug. Take as directed by your doctor or follow the direction printed on the product insert. Dosage is based on your condition. Tell your doctor if your condition persists or worsens. Lavir Tablet is used for Hiv infection, Hepatitis b virus infection and other conditions. Lavir Tablet contains Lamivudine as an active ingredient. Lavir Tablet works by increasing the number of infection fighting cells in the body. 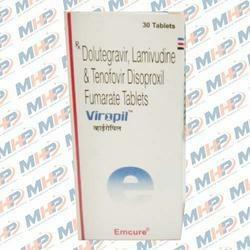 Emcure Pharm manufactures Lavir Tablet. Heptavir 150 mg Tablet is an antiviral medication. It prevents the multiplication of virus in human cells. This stops the virus from producing new viruses and clears up your infection. Hetero Drugs manufactures Heptavir Tablet. Take this medicine in the dose and duration as advised by your doctor. Swallow it as a whole. Do not chew, crush or break it. Heptavir 150 mg Tablet may be taken with or without food, but it is better to take it at a fixed time. 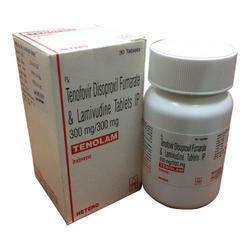 Tenolam Tablet is a combination of two anti-HIV medicines: Lamivudine and Tenofovir. They prevent HIV (virus) from multiplying, thereby reducing the amount of virus in your body. They also increase the CD4 cell (white blood cells that protect against infection) count in your blood. Take this medicine in the dose and duration as advised by your doctor. Swallow it as a whole. Do not chew, crush or break it. Tenolam Tablet is to be taken with food. Tenolam E Tablet is used in the treatment of HIV infection. 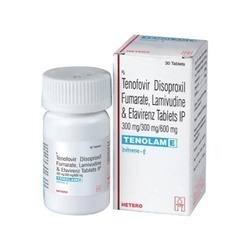 Tenolam E Tablet is a combination of three antiviral medicines: Lamivudine, Tenofovir and Efavirenz. They work by preventing HIV (virus) from multiplying, thereby reducing the amount of virus in your body. They also increase the CD4 cell (white blood cells that protect against infection) count in your blood. Take this medicine in the dose and duration as advised by your doctor. Swallow it as a whole. Do not chew, crush or break it. Tenolam E Tablet is to be taken empty stomach. Estiva 600 mg tablets is used in the treatment of HIV infection. Estiva 600 mg tablets prevent the multiplication of HIV virus in human cells. Thus stops the HIV virus from producing new viruses. 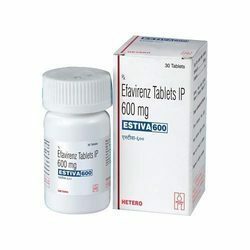 Estiva Tablet contains Efavirenz as an active ingredient. Hetero Drugs manufactures Estiva Tablet. Take this medicine in the dose and duration as advised by your doctor. Swallow it as a whole. Do not chew, crush or break it. Estiva 600 mg tablets is to be taken empty stomach. Tenof 300 mg Tablet is used in the treatment of HIV infection and chronic hepatitis B virus (HBV) infection. Tenof 300 mg Tablet is an antiviral medication. It prevents the multiplication of virus in human cells. This stops the virus from producing new viruses and clears up your infection. Take this medicine in the dose and duration as advised by your doctor. Swallow it as a whole. Do not chew, crush or break it. Tenof 300 mg Tablet is to be taken with food. 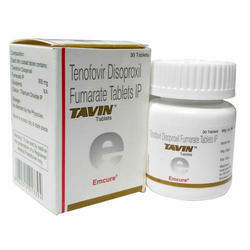 Reviro (Tenofovir ) is used with other HIV medications to help control HIV infection. It helps to decrease the amount of HIV in your body so your immune system can work better. This lowers your chance of getting HIV complications (such as new infections, cancer) and improves your quality of life. Use Reviro (Tenofovir ) as directed by your doctor. Check the label on the medicine for exact dosing instructions. · An extra patient leaflet is available with Reviro (Tenofovir ). Talk to your pharmacist if you have questions about this information. · Take Reviro (Tenofovir ) by mouth with or without food. · Continue to take Reviro (Tenofovir ) even if you feel well. Do not miss any doses. · Taking Reviro (Tenofovir ) at the same time each day will help you remember to take it. · Do not suddenly stop taking Reviro (Tenofovir ) without checking with your doctor. This may cause the virus to become less sensitive to this or other medicines. If you have hepatitis B, your condition could become worse if you suddenly stop taking Reviro (Tenofovir ). · If you miss a dose of Reviro (Tenofovir ), take it as soon as possible. If it is almost time for your next dose, skip the missed dose and go back to your regular dosing schedule. Do not take 2 doses at once. Danavir (darunavir) is a protease (PRO-tee-ayz) inhibitor antiviral medicine that prevents human immunodeficiency virus (HIV) from multiplying in your body. 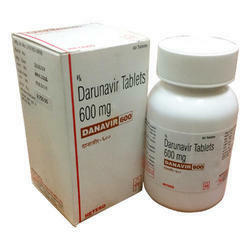 Danavir is used to treat HIV, the virus that can cause acquired immunodeficiency syndrome (AIDS). How should I take Danavir? Take Danavir exactly as prescribed by your doctor. Follow all directions on your prescription label and read all medication guides or instruction sheets. Danavir must be taken together with another medication called ritonavir. Use the medicine exactly as directed. Danavir works best if you take it with food. Take Danavir and ritonavir together at the same time every day. Swallow the Danavir tablet whole and do not crush, chew, or break it. 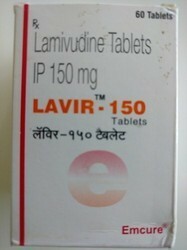 Lamistar 150 mg/30 mg Tablet is used in the treatment of HIV infection. 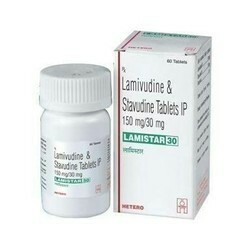 Lamistar 150 mg/30 mg Tablet is a combination of two anti-HIV medicines: Lamivudine and Stavudine. They prevent HIV (virus) from multiplying, thereby reducing the amount of virus in your body. They also increase the CD4 cell (white blood cells that protect against infection) count in your blood. Take this medicine in the dose and duration as advised by your doctor. Swallow it as a whole. Do not chew, crush or break it. Lamistar 150 mg/30 mg Tablet is to be taken empty stomach. Take it preferably one hour before or 2 hours after food.